The 5 year old daughter of Adnan Rasheed one of the top Taliban commanders at Tehreek-e-Taliban Pakistan (TTP) was allegedly featured on an audio release believed to have come from the group. This could not be independently confirmed. The child known as Hafsa Khorasani (not her real name) had a message for Malala Yousafzai, a young girl shot by the Taliban on 9 October 2012 as she boarded her school bus in the northwest Pakistani district of Swat. Malala championed education for girls and wrote a blog for the BBC encouraged by her father Ziauddin, an educator in Swat. She was co-recipient of Nobel peace prize in 2014 which polarized opinions some praising her as a champion of rights for girls, others accusing her and her father of being spies for western governments. Rasheed, now in his late 30s worked within the Pakistan Air Force as a junior technician in 1997. 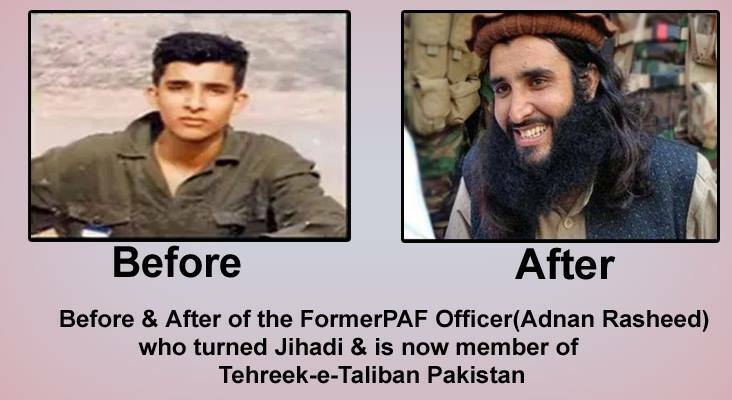 He became radicalized whilst serving, turning to jihad (a war or struggle against unbelievers) and was convicted for an attack on then President General Pervez Musharraf in December 2003 for which he was given the death penalty. Whilst in prison he was heard in a video recording encouraging supporters to “listen to my wife” who helped highlight his case. Rasheed was later freed along with 400 other inmates when Taliban militants stormed Bannu Prison in 2012. He went on to help mastermind a prison break himself at Dera Ismail Khan releasing 175 prisoners including 35 high-profile militants on 30 August 2013. Rasheed who has 2 wives, one a doctor, is close to TTP leader Mullah Fazlullah and continues to be a thorn in the side of the authorities with his messages to the military encouraging them to join the Taliban. Now Rasheed’s daughter Hafsa (believed to be from his first marriage) delivers a message in the vein and language of her father who is multi-lingual. She begins by saying, “Bismillah-ir-Rahman-ir-Rahim” “In the name of God, the Most Gracious, the Most Merciful” there is only one Allah and we should honor Him. 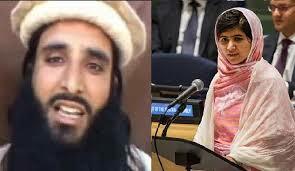 Hafsa advises to follow the Quran and not to follow ways of kuffar (unbelievers) as Malala will become lost. She reminds, “you will see kuffars are very unhappy” and believers are happy and that Allah can bring happiness and peace in this world. Hafsa says to Malala “you must be wondering how I know all this” and tells her it is through reading and understanding Quran and Sunnah. (This is the body of traditional social and legal custom and practice of the Islamic community. Along with the Qurʾān (the holy book of Islam) and Hadith (recorded sayings of the Prophet Muhammad), it is a major source of Sharīʿah, or Islamic law. Hafsa says “this is the best education”. Hafsa echoes her father’s comments highlighting that Malala’s education is not the right education as she got it from kuffar and it is taking her away from the Creator and one true Allah. The message is to join Hafsa in Islamic education for benefit of Khalifah and not take any other system. Umar Media, the media wing of TTP recently launched an English radio station, Umar Radio FM. The first transmission featured “The Speech of Commander Adnan Rasheed Ex Airman Pakistan Air Force.. Subject : Message to the security force of Pakistan” And “Beautiful English Nasheeds”.